This card depicts a beautiful garden in full bloom. 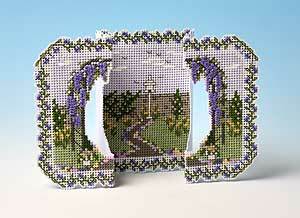 A rustic archway covered in purple wisteria surrounds a dovecote standing amongst a display of flowers. A floral border gives a lovely decorative edging.